To wander through the caves at Giuseppe Contratto's masterpiece of a winery in Canelli is to shake the living hand of almost 150 years of tradition of Italian sparkling wine. The very first bottles of Italian method champenoise were made here, as was the very first vintage dated Italian method champenoise-- Metodo Classico Extra Brut in 1919. The underground cellars, dug out manually when the winery was founded in 1867, took ten years to complete, and are more than 100 feet underground. They are far more impressive than anything in Italy, and rival the most spectacular in Champagne. They are, in fact, slated to become a UNESCO World Heritage site in the summer of 2012. At one time, wine was leaving from these cellars to destinations all over the world. Contratto was supplier not only to the Vatican, but also to the House of Savoy (the Italian Royal Family), as well as to the British monarchy. Contratto was shipped across the world as the beverage of choice for the ambassadors and colonial governors of the British Empire. Within Italy, the name Contratto itself is inextricable from the history of "bollicine"--the estate was for a long time the number one producer, predating the arrival of Franciacorta by 90 years. In 1993, after 126 years in the hands of the Contratto family and somewhat in decline, the winery was sold to the Bocchino family, who own a local grappa distillery in Canelli. Carlo Bocchino and his family undertook an extensive restoration of the property, but found it difficult to manage both the distillery and the "bollicine" business. In 2007 he sought help. Carlo Petrini, president and founder of the Slow Food movement suggested that Bocchino meet Giorgio Rivetti, a long-time lover of sparkling wines and importer to Italy of some of the finest Champagnes (many of which Michael Skurnik Wines also carries: Aubry, Gaston-Chiquet, Egly-Ouriet). Giorgio came on as a secret consultant, but became so enamored with the project that in 2009 he and his brothers decided to buy Contratto from the Bocchino family. Negotiations finished in 2011 and as the new owner of the Contratto winery, Giorgio is now launching the first wines he made in the 2007 vintage. 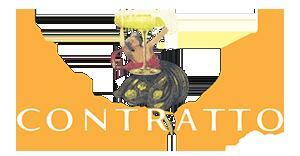 Contrary to most other sparkling wines in Italy, the focus at Contratto is on Pinot Noir. All wines are a minimum of 80% Pinot Noir with the balance as Chardonnay. The grapes come from the Oltrepo Pavese in Lombardia on the border with Piedmont. Both Pinot Noir and Chardonnay have a long history here: they have been cultivated in this area for over 100 years. Though Contratto does not own the vineyards, they work closely with their growers to ensure the best quality. The vines are approximately 40 years old, and are at the high elevation of 400-500 meters above sea level along the spine of the Apennine mountains. In the long term, Spinetta is planning on investing in their own vineyards in the Alta Langa area of Piedmont to prove that Northern Italy has the soil and climate to make "bollicine" to rival the best made in the world. The labels are the original design of Leonetto Cappiello, considered one of the fathers of belle époque poster-advertisements.